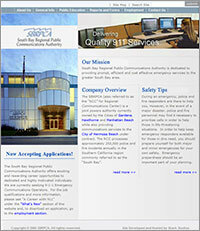 The South Bay Regional Public Communications Authority approached Shark Studios to design a website which would provide the public with essential information regarding the 911 emergency services they provide to 4 cities in the South Bay area of Los Angeles. It also needed a secure, private Intranet where Police and Fire Chiefs could login and view confidential reports or submit online forms. A paperless online forms system was needed to quickly direct requests for services to the proper personnel. A virtual tour of the SBRPCA facility was deemed important for marketing the facility to other potential cities in the Los Angeles area. The site needed to be in an easy-to-navigate, organized, and attractive format. The resulting website increases the organizations visibility and marketability to other cities as well as making the public more aware of the vital emergency services it provides to the Los Angeles area. The new paperless online forms system saves valuable resources and speeds response time of personnel to requested services. The Intranet allows Police and Fire Chiefs to login and view confidential reports in a secure environment. The new navigation system allows any page or file in the website to be retrieved in just one or two clicks. "The South Bay Regional Public Communications Authority (SBRPCA) has provided emergency police and fire communications for nearly 30 years. The SBRPCA�s transition from a long decline of neglect to a state-of-the-art operation, which began in 1998, included Shark Studios� assistance in developing our first website. This enabled citizens to follow the construction progress of our new 20,000 square-foot facility completed in 2002, solidifying the SBRPCA�s rebirth. In 2004, the SBRPCA once again called upon Shark Studios to assist in creating our new, full-service website. The back bone to this website is Shark Studios� new �Content Management� software, which allows in-house personnel to manage all information on our website. Meeting agendas, minutes and reports are easily downloaded and police and fire administrators have instant access to needed reports and statistics via the Authority�s website intranet. Additionally, information on a variety of issues is available to the public. 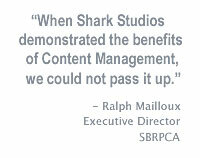 When Shark Studios demonstrated the benefits of Content Management, we could not pass it up."